Maintaining healthy blood cholesterol proves important to good health, and high cholesterol puts you at risk of heart disease. The fat in your diet has an effect on your blood cholesterol. Saturated and trans fats increase the levels of LDL "bad cholesterol," and reduce the amount of HDL, or "good cholesterol," which makes them a threat to your health. The cholesterol in your diet can also have a negative effect. Avoid foods rich in these lipids if you suffer from high cholesterol -- avoiding them can help get your cholesterol under control. Do not cook with or use margarine and butter if you have high cholesterol. Margarine has high levels of partially hydrogenated oil, which are a form of trans fat. Harvard says that margarine is so bad for you that butter is preferable to stick margarine. Stick margarine has 2.8 grams of trans fat and 2.1 grams of saturated fat per tablespoon. 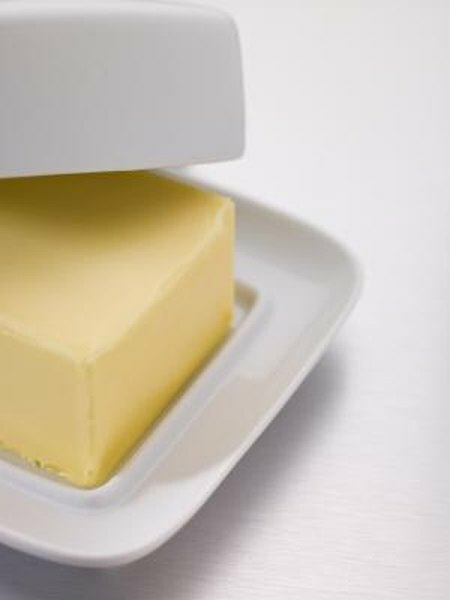 Butter has .3 grams of trans fat but 7.2 grams of saturated fat per tablespoon. Neither is desirable. Cooking in healthful oils such as olive oil or grapeseed oil that contain high amounts of unsaturated fats instead of saturated or trans fat will be better for your cholesterol. Avoid fatty cuts of meat if you have high cholesterol. Red meat is among of the primary sources of saturated fat in most people's diet. Foods such as lamb, prime rib, T-bone steaks and chicken wings are especially high in saturated fat and should be eaten infrequently. Harvard suggests that you avoid the processed meats, like hot dogs, bacon and deli meats, entirely. Keep saturated fat as no more than 7 percent of your total caloric intake. Avoid any foods cooked in or made with partially hydrogenated vegetable oil. According to Iowa State University, the most common source of trans fatty acids is partially hydrogenated vegetable oil, which is commonly found in shortening, frosting, crackers, candies, baked goods, fast foods, salad dressings and many other commercial desserts. Iowa State says that simply not eating foods that list "partially hydrogenated" vegetable oil will significantly reduce your trans fat intake. While dietary cholesterol does not pose the same level of threat as unhealthy fats -- in most people, it actually has only a modest amount on blood cholesterol levels -- you should still avoid it if you have high cholesterol. That's because some people are particularly sensitive to dietary cholesterol and eating-cholesterol-rich foods triggers a spike in harmful blood cholesterol levels. Limit your intake of whole eggs and egg yolks and shellfish, as well as fatty red meat. Those with high cholesterol should not consume more than 200 milligrams of cholesterol daily. Harvard School of Public Health: Protein -- What Should You Eat?